The energy mix, also known as “energy matrix”, is the final composition (usually on annual basis) of the electricity production of a country. In other words, the energy mix breaks down the different sources of energy generation (renewable and non-renewable) that contributed for covering the energy demand of a country. In Spain we have a range of generation sources, which add up to a total installed power capacity of 104,160 MW. However, this capacity is not always needed – most of the time the instanataneous (power) demand is below this capacity. Hence, a large share of this capacity is only used occasionally and this varies based on the technology and power demand at different points. 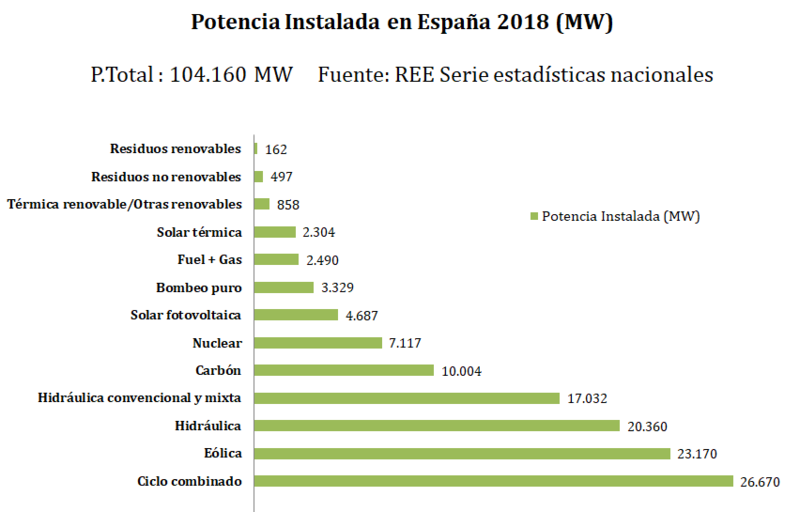 The following table shows the distribution of installed power throughout Spain, according to the Spanish TSO – Red Electrica de Espagna (REE) – source: National statistics database. How is the amount of generated energy being determined? The problem of generating electricity is that it needs to be consumed instantly, since our energy systems are still not capable of storing large amounts of energy. If this does not happen, then the system is in an imbalance and it results to what we all know as ‘black-out’. For this reason, the energy consumed by the whole country must be predicted in advance, in order to make sure that this instantaneous match of demand and supply is always achieved – and if not, be ready to act fast. These predictive calculations are made the day before and are based on very complex statistical profiles and among other indicators are: labor, weather and economic activity. This task is becoming more complicated, as the penetration of renewable generation sources is growing and the generated electricity is intermittent (hence uncontrollable). 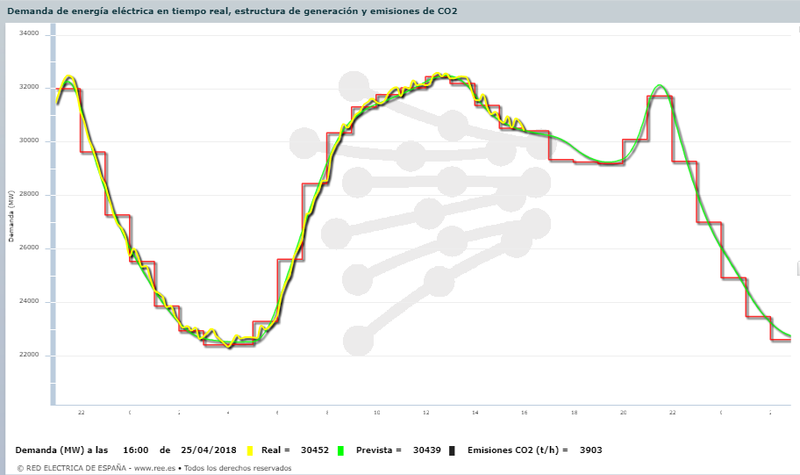 Accessing the Red Eléctrica Española application, we can see the predicted demand of energy, the demand in real time and the structure of generation and CO2 emissions associated with each generation source. Below, screenshots from REE website – feel free to access yourself! Monitoring of energy demand (MW). The real demand (yellow curve) reflects the instantaneous value of electricity demand. The demand forecast (green curve) is prepared by Red Eléctrica with consumption values ​​in similar preceding periods, correcting it with a series of factors that influence consumption. The operative hourly schedule (red stepped line) is the scheduled production for the generation groups to which the supply of energy has been awarded in advance (through the matching of the daily and day-ahead markets, as well as in the markets of deviation management and tertiary regulation). These last two are managed by Red Eléctrica, based on the actual evolution of demand (compared to the predicted). Access this graphic through this link. This graph shows the distribution of energy generation as a function of time, as well as the source that produces it. We can see nuclear and coal technologies as base and a large contribution of hydro and wind, followed by the rest of generation sources. Access this graphic through this link. How is the price of energy established? Direct sales to marketers through PPAs or bilateral contracts. In this case, the producers agree on a contract for the direct sale of energy with a Marketer and a price for all their production is agreed between them, thus distancing themselves from the possible price fluctuations of energy in the auction (Electric pool). The PPAs are of interest to both parties – Producers and Marketers – and serve as a risk adversion mechanism for their investment and competitiveness in the electricity market, respectively. On one hand, the Producer secures from a future, with a 100% renewable pool and lower electricity prices, which would generate a possible risk (decreased revenues and loger paybeck period for the producer). Furthermore, in renewable energy projects there is usually a strong influence of a third party (the investor or financier), normally a banking entity that wants to de-risk the return of their investment. In these cases PPAs become very good guarantees for the producers to acquire their financing. The Marketer, on the other hand, avoids the exposure to energy market instabilities (e.g. nuclear shutdowns in France or Spain) or external factors like weather conditions (drought=no hydro power) causing price spikes in the electricity pool. This is the reason why, as a Marketer (utility), you would be interested in choosing PPAs for covering your consumers’ needs – thus reducing your operational risk and offering competitive electricity prices to your customers. This part generates misunderstandings for most people. The auction that determines the price of electrical power does not follow the typical pattern of supply – demand. OMIE, is in charge of organizing and accommodating the energy auction of the energy pool. Its role it to collect the offers/prices of all the generating units that are available for electricity generation, in order of price – from cheapest to most expensive – making sure to cover all the predicted demand which has been requested by the marketers one day ahead. Since the OMIE chooses at any point, various energy generation packages with a range of prices , but all generating companies must charge the same for the price of electricity, the mind-challenging aspect appears. 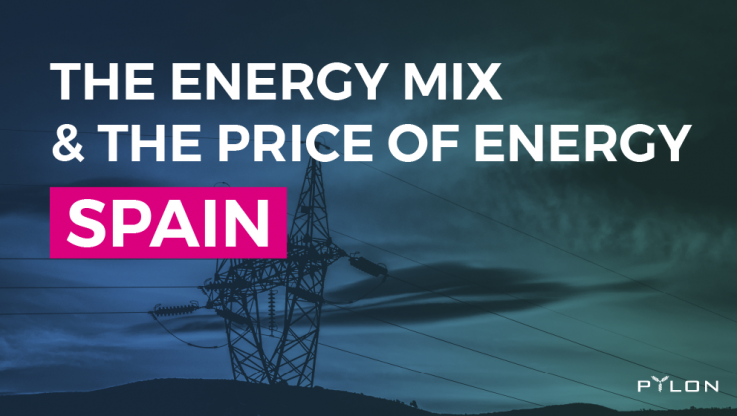 In the end, the price of electric power is established by the last offer that gets accepted in the energy auction and clears the demand of the future market. That is, the last most expensive offer is the one that determines the price to pay for all of the electricity produced by all generation technologies. – a better integration of the renewable mix (the production conditions -climatological- differ locally allowing the supply to be shared among adjacent regions), thus avoiding the dependence on centralized sources of pollutant and high-cost generation that define the electricity pool’s “global” price. In few words: more competitive prices with a reduction in CO2 emissions, greater security compared to a centralized model and a more elastic, locally aggregated demand/supply that prevents the costly expansion of networks.